Experience the purifying effects of pure Eucalyptus and Spruce Essential Oils. The invigorating balance of Spruce and Eucalyptus Essential Oils provides the ultimate spa experience. This therapeutic blend will clear your senses and leave your body feeling revitalized. 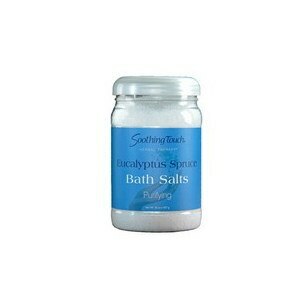 History of Bath Salts - Bath salts have been used for over 4,000 years. The earliest use has been traced back to 2700 BC in China. Dead Sea Salt - Contains 21 minerals, used for centuries to stimulate circulation, loosen tense muscles and joints, and soothe and soften the skin. Epsom Salt - Is a known natural remedy for relieving stress and the aches and pains of muscle strains. Evaporated Sea Salt - Is natural, from the sea, rich in minerals magnesium, calcium and potassium. Mineral Salts - Of the more than three dozen known minerals, nineteen are necessary for good health. Mineral salts contain up to 10 essential minerals. Eucalyptus Essential Oil - Purifying and healing aromatherapy. Spruce Essential Oil - Grounding and balancing aromatherapy. Camphor Essential Oil - Rejuvenates the senses. Disclaimer: The data presented here relates only to the specific material designated herein and does not relate to use in combination with any other materials or in any process. The information set forth herein is based on technical data believed to be reliable. It is intended for use by persons having technical skill and at their own discretion and risk. Since conditions of use are outside our control, no warranties, expressed or implied are made, and no liability is assumed in connection with any use of this information. Judgments as to the suitability of this information for the user's purposes are necessarily the user's responsibility. Although reasonable care has been taken in the preparation of this information, no responsibility is assumed as to the accuracy or suitability of this information for its application to the users intended purpose or for consequences of its use. Ingredients: Dead Sea Salt, Epsom Salt, Evaporated Sea Salt, Mineral Salt, Spruce (Tsuga canadensis) Essential Oil, Eucalyptus (Eucalyptus globulus) Essential Oil, White Camphor (Cinnamomum camphora) Essential Oil. While filling the bath, add 1 cup of Bath Salts. Indulge yourself and soak for 20-30 minutes. Wash and rinse after soaking and feel renewed, refreshed and relaxed.